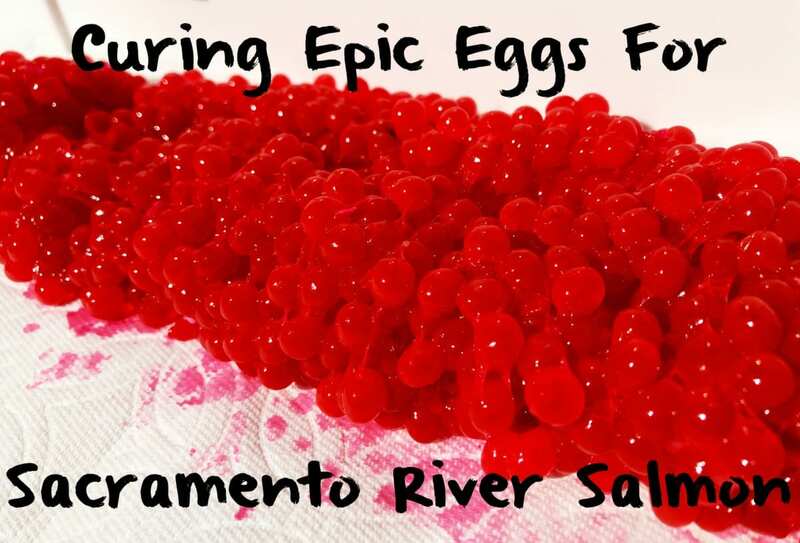 There are many techniques that are used to catch Sacramento River salmon, but dragging, hovering and back bouncing roe through holding water is at the top of the list, especially in the upper reaches of the Sacramento River where salmon season should be good through October. These egg fishing techniques have standout days, but for any of them to produce consistently your bait has to be dialed in. Kings are the most finicky biters I have fished for. If your eggs lack anything but the best cure and bite stimulants you’re going to watch a lot of fish being caught in other boats. I’m going to cover the egg recipe we use on my boat. It has put fish in the box every trip I’ve run this season. Preparing your skeins before curing starts with bleeding your salmon after its landed. This helps reduce the amount of blood left in the skeins when you harvest them from the salmon. I, like most, take the skeins from the salmon before I cut the fillets and place them into a Ziploc and into the bait cooler. It’s hot the Sacramento Valley. When I get home after a day on the river I remove any blood that is left in the skeins and put them in the fridge. It’s not critical to cure them right away, but it should be done within a few days. I butterfly several skeins and lay them side-by-side, egg side up. This allows me to cure several skeins at a time. The first ingredient I add is non-iodized or kosher salt to the open face of the berries. You don’t need to use a lot, rather lightly dust the skein. The kings I fish for are 260 miles upriver. Slightly bumping up the salt content in my cure is effective. Apply a light layer of Fire Cure on the skeins. Then flip them and do the same thing on the other side. Then I’ll lightly work the Fire Cure into the skeins with my fingers. Pick the skeins up individually and place them in a gallon Ziploc. I use a generous one-second squirt of Pautzke Red Nectar into the Ziploc. During the curing process the Nectar is sucked back into the eggs giving them the final dose of stimulants needed to create a premier egg. Curing time is important. 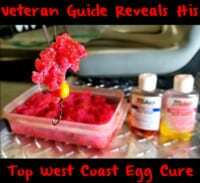 Fire Cure eggs can be done in a day. However, I let my eggs cure for five days before I freeze them. 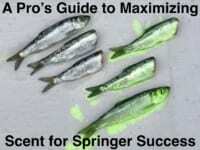 They can be fished or freeze for later use. There are different ways to store and freeze cured eggs. I prefer to put two large skeins in a baggie, freeze them for five days and then vacuum seal the bag. They’ll last for three years with this method. Since most of my Fire Cure eggs are frozen to be used the following season I thaw the frozen eggs slowly before removing them from the vacuum-sealed bag. Once thawed, drain the excess juice from the bag. Because I drift fish most of the time I need a firmer egg that stays on the hook. To achieve this I set the skeins on paper towels and let them get a little tacky before dusting them with Natural BorX O Fire. Once they are firmed up I wrap each skein in an unscented paper towel, put them in Ziploc and refrigerate. They are ready to be fished. Editor’s Note: Jeff Goodwin operates Jeff Goodwin’s Guide Service. For more information on his guided Sacramento River trips please visit https://www.facebook.com/jeffgoodwinfishing or https://www.jeffgoodwinfishing.com.